Look, look, look at me. You need to look at me. That’s what she’s going to say this morning to the adorable and restless group of four-year-olds who are practicing their songs for their spring program. She’s a teacher who knows these little cherubs will be just fine if they focus their eyes on her. They’ll know when to start singing. They’ll know what words to sing. They’ll know when to stop singing and when to rest instead of barreling right through the song so they can get to the big finish. They are also occasionally annoyed with each other for various infractions such as not sitting in the right place, talking when they aren’t supposed to be talking, touching someone else’s hair, or messing up the singing. They are eager to wave at the piano player (that’s me) while climbing up the steps to the stage, which inevitably holds up the rest of the line. They are distracted by the child next to them, the child in front of them, and their own fingernails which apparently merit their undivided attention in the middle of a song. So, no matter how many times their ever-patient teacher says, “Look at me,’ they forget. And they look away, maybe at their neighbor or their fingers or the pianist. They look anywhere and everywhere but at the teacher. Then there is the miracle moment, that one microsecond in time when the whole class actually looks at the teacher and we all smile back at them because they just sound great and their parents are going to take tons of pictures and post lots of videos on Facebook because four-year-olds are awesome. Preschooler aren’t the only ones who are easily distracted. I know another choir directer in her nineties and I’ll tell you what she has to say to her own adult choir all the time. Let’s be honest. Most of the time that’s probably what God is saying to us. We’re a distractable lot, us humans, easily caught up in everything around us and everything within us. We may grow up, but we don’t necessarily grow out of it. We’re distracted by others around us. Why are they doing that? It’s invading my space. It’s so annoying. She is doing it wrong! That not right and it’s not fair! She sings better than me. Why is she so perfect? How come I can’t look like her or sing like her or act like her? We’re perpetually distracted by circumstances. The bills are too much. The job is too difficult. The marriage is too strained. The kids are too lost. This is hopeless and impossible. We’re distracted by our own inner voices. You are a failure. You’re a mess. I give up! I cannot do this. I’m not capable. It’s just too hard. I’m not equipped, not strong enough, not sufficient! We’re whining and complaining. Maybe flat out freaking out. Throwing a tantrum. Collapsing under the strain of anxiety. But God is saying what He’s always said: Look. At. Me. It’s an ascension Psalm, one in a series of songs the Jewish travelers would sing during their climb up to Jerusalem for the feasts and celebrations, a traveler’s hymn and a pilgrim’s chorus. And, aren’t we all travelers here? The journey had its dangers. Stumbling over rocks (verse 3), heat stroke and even moonstroke (verse 6). But the promise is there. Our help doesn’t come from looking down at our clumsy feet. It doesn’t come from looking to the mountains, the sun, the moon, our fellow travelers, or the evil that threatens to overpower us. 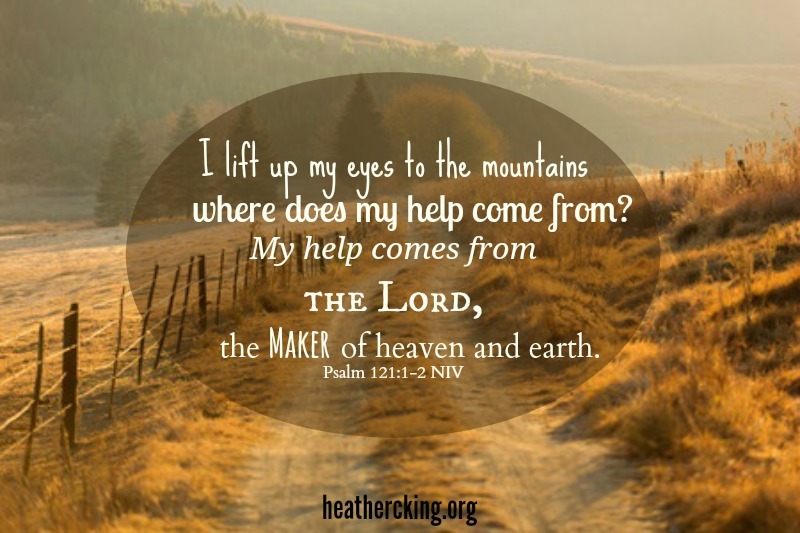 We don’t need to look anywhere at all except at the Lord because our help comes from Him. 5 The Lord is your keeper…. from this time forth and forevermore (Psalm 121 ESV). Look at Him for guidance, for encouragement, for help, for strength, for assurance, for conviction, for compassion, for salvation, for provision, for direction.